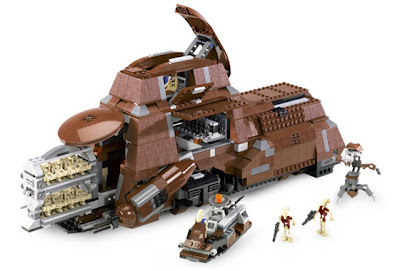 My son, very badly, wants a Star Wars LEGO #7662: Trade Federation MTT. My wife believes it is a large, expensive piece(s) of plastic that will be destroyed, lost and forgotten. When I was a nine years old boy, I wanted, with all my heart and soul, a Fort Navarone playset. It was a giant mountain of a fort that came with armies, vehicles, guns and a real, live working elevator. It was the greatest thing in the world. Dad was in the kitchen and I stood at the doorway with the catalog behind my back. He beckoned me forward and I came in, my socks sliding across the linoleum. I put the catalog out and he took it. Dad looked over his glasses to get a closer view. I forgot to say it was the only gift I wanted for Christmas. He handed the catalog back and I left the kitchen. I tore out the page and hid it between my mattress and bedspring. I’d pull it out every so often, but those times became fewer and further between. Months later I found it when we were pulling our mattresses off our beds to have a pile of soft to jump into from the top bunk. By that time I had hardened my heart to it. I threw it out. I’m not mad at my father because of this. He’s right. It was a big hunk of plastic that probably wasn’t worth the money. To him. Now my son wants this huge, expensive hunk of plastic that he will probably destroy, lose and forget. Get him a Jawa Sandcrawler instead. No self respecting parent would get their kid a toy from the Star Wars prequels. Next thing you know, he's gonna wanna wear that Jar Jar Binks costume 24-7. When I was a kid, I seriously wanted the "original", Lego Monorail. I never got it. This slight was also compounded by the fact that my best friend got it and I was always left watch him play with it. Legos are the gift that keeps on giving! Oh my gosh I had Fort Navarrone! It was great. The best part was having the guy with the granade crawl all the way up to the top and toss a granade into the window. The Nazis, you see, in their hubris never thought that a single soldier could crawl all the way up the mountain and destroy their entire fortress with one well-placed granade, so their giant guns were incapable of shooting the guy on the mountainside. Dumb Nazis. Anyways, later I became a pacifist and gave up all my war toys. I traded the whole thing to some kid for his box of baseball cards. Then another kid beat me up and took the best cards out of the box. So much for being a pacifist. 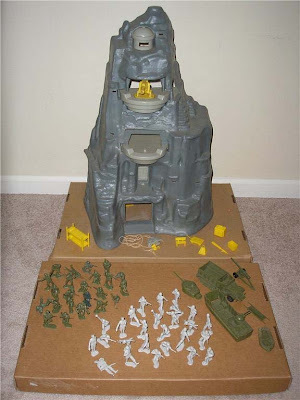 I had the Fort Navarone playset. It was the coolest thing ever. Even to this day when I think back how cool Fort Navarone was. I am 42 now and I got that when I was 7 or 8. They dont really make cool things like that anymore. I must admit I always wanted to be the Nazis because they got to hang out inside the mountain. Your father was wrong. No toy from my childhood got more use for the money than the Guns of Navarone! Your tale affects me deeply, Sir. My Dad died several years ago, and my Alzheimer's-afflicted mother is now in a personal care home. I have been going through the remains of their now-abandoned house, which must be one of the least pleasant tasks a person could ever be saddled with. So, last week, I discovered my old Navaronne Mountain, wrapped scrupulously in heavy plastic and duct-tape, in that thorough-going way that only my order-obsessed German war-bride mother could ever manage (and YES, even as a kid I recognized the irony of the delight I took in playing with this particular toy...my child-psychiatrist need hardly have pointed it out with such frequency). The mountain and the accoutrements remain, but the soldiers are long gone...a real shame. How in the hell the makers managed to mold such incredible arrogance into the tiny features of the pale Nazis, or such earnest zeal and fortitude into the mugs of the little green, dog-face Joes is beyond me. Just like a previous Poster, I SWEAR that my own scenarios frequently featured the guy with the grenade creeping up the mountainside too, surprising the Nazis in the upper gun-emplacement...how can that be? Was it in the film? I can't recall. I had hoped to recoupe enough to cover maybe a few bags of cat-chow for the damned thing on eBay, but I tell you- your nostalgic trip there has shaken me up fairly. I could likely be coaxed into passing it along, especially if it might help a fellow-traveller heal an old injury. You'll need some soldiers, of course. Aside from a missing elevstor, I think the rest of it is there. How ghastly...I can't bear to consider such horrors. 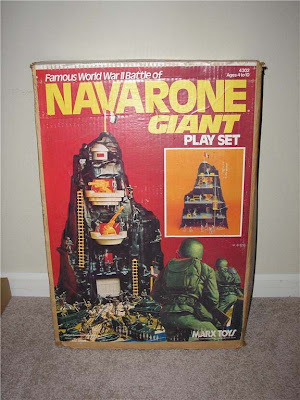 I got the Navorone set for Christmas when I was around 10 years old. It was my favorite toy and I played hours upon hours with it and my army men. This makes me remember how special Christmas is for kids and what great memories I have of my childhood. I have 2 kids now and my almost 4 year old son always brings me catalogs to show me the toys he wants SOOOO BAD.